That’s been me this past week. I confess to falling in love with Kate Spade’s “Bow Valley” bag when we first locked eyes this past Sunday in Fashion Island in Newport. Nordstrom’s being my first stop, I obsessed the rest of the day over this soft, buttery leather bag with a shiny patent half bow. The one thing I was obsessing about was the cost. Ugh. This is when I became a stalker. I saw the black version was on sale at KateSpade.com so I thought the pink must have been an exclusive to Nordstrom. I stalked the Nordstrom site online. Morning. Night. And finally I found it had been reduced 33%! I quickly made my purchases (I’m seeing which one I like since the store only had the smaller bag). Which one do you like? The smaller, more prim bag or the shoulder tote? 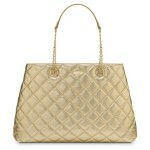 Also Kate Spade’s Spring 2012 hit today. Very mod and very pink. Love! This is also my first attempt at Polyvore. Be kind. lol! The pink one – Cute! They are beeeoootiful!!! Well done with polyvore – I am really confused by it all and thought I could make a board like this on pinterest, oh blimey. I need to go on polyvore and have an experiment! 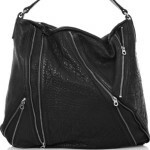 Very cute bag…I love Kate Spades line more than ever especially her clothing and jewelry, classic with a fun twist! I need to look at polywore. Don’t know anything about it. Another skill to master, I guess. I feel like I have a new one at every corner. Kate Spade bag + pink = LOVE!! Gorgeous….and 33% off woo woo ! Love it!